Calcus.com is a Finnish advertising company specializing in content marketing and native advertising. They provide services to the top Finnish companies and produce hundreds of articles and videos annually. Calcus.Tech is a content marketing platform that automates the process of content distribution and delivery to media channels. Poor performance and low CTR of banner advertising make marketers look for more efficient promoting methods. Native advertising is successfully replacing annoying banners. Content marketing campaigns based on useful and valuable content show good results. 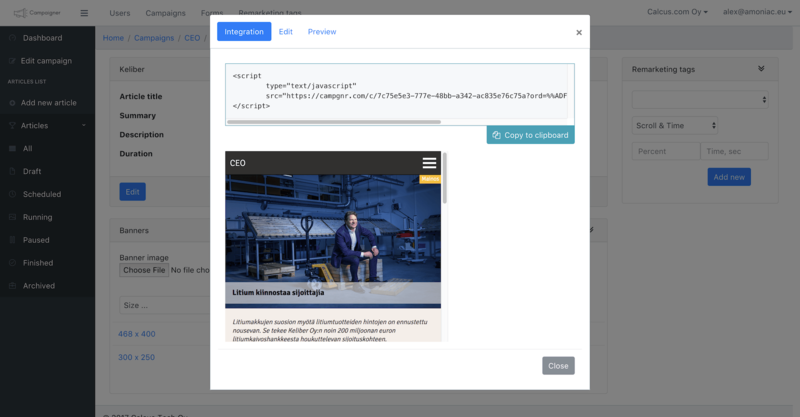 Content marketing platforms like Calcus.Tech automate the process of content creation and delivery to a bunch of media websites. Inbuilt targeting and analytical tools increase the effectiveness of marketing campaigns. 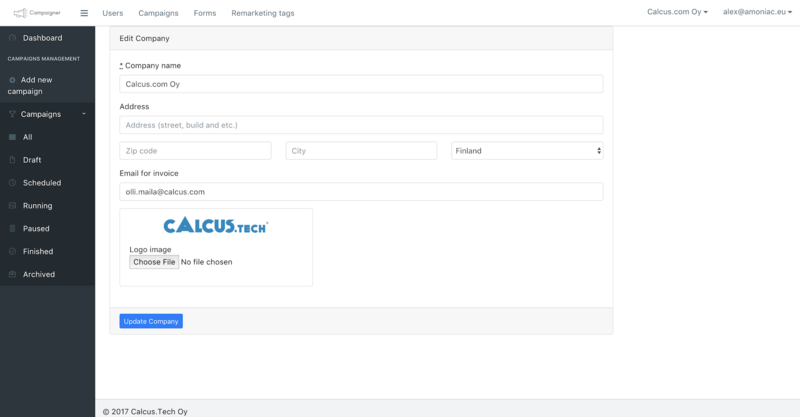 The Calcus.Tech platform allows to create and manage advertising campaigns for multiple clients through the user-friendly admin panel. A marketing manager uploads content - articles, images, or video - into the platform. There he customizes or personalizes it depending on targeting parameters. Targeting sets in terms of various parameters: demographic, geographic, behavioral, etc. The platform connects to media companies, which publish sponsored content on a paid basis. Content delivery is carried out automatically depending on campaign budget and targeting settings. On media websites, native ads look exactly like informational articles. Since sponsored content contains valuable information that matches current needs of the audience, it generates high engagement. 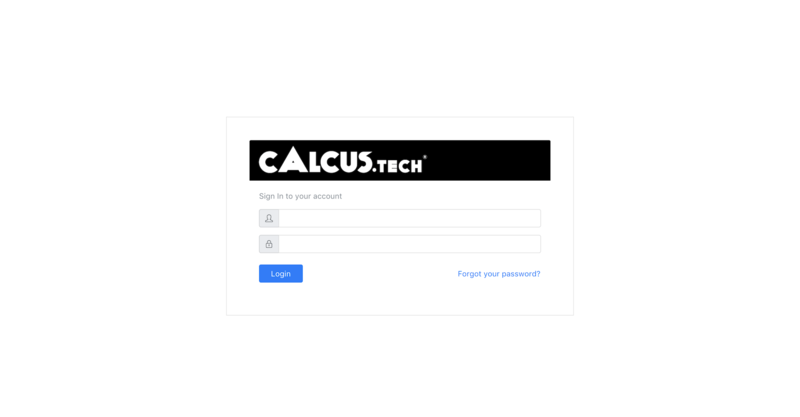 The Calcus.Tech project is ongoing, therefore only technical achievements can be measured. At the moment the application processes up to 20K requests per minute, average response time makes up 1 ms. The Amoniac team works on the project from the very beginning. Guys created the prototype and moved to development. They realized the back-end side on Ruby On Rails, PostgreSQL, and Golang. For data storage they chose InfluxDB. 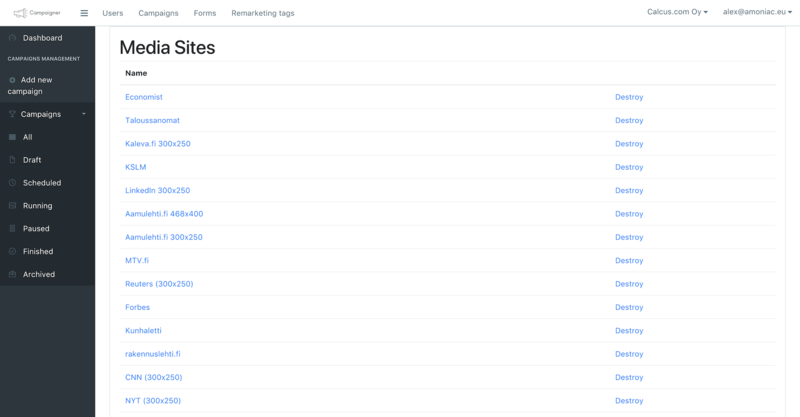 They also integrated AdForm and Google Analytics to the platform. The project is still ongoing and needs UI redesign. Nevertheless, the application is deployed to the live server and works in normal mode.